US President Donald Trump closed out his 28-hour visit to Israel with high praise for Prime Minister Binyamin Netanyahu, a passionate call for peace between Israelis and Palestinians and a solemn vow that Iran would not obtain nuclear weapons during Trump’s term as president. Speaking at the Israel Museum in Jerusalem to an A-list of Israeli public officials including Knesset members, mayors, the chief rabbis, political activists and others, Trump repeated his call to “obliterate” the ideology of terrorism and spoke about the political, historical and defense ties between the United States and Israel. “[Israel is an] abundant land, rich in history, culture, opportunity and in spirit,” Trump said. The president added that Israel is a place where “all faiths are free to live according to their conscience and follow their dreams. “I call upon all people from all faiths to draw inspiration from this city and set aside sectarian and religious differences, and find common ground in making the future of this region so much better than it is now. Change must come from within and can only come from within,” the president said. Zionist Union MK Nachman Shai, head of the Knesset Lobby for Israel-US Relations, said Trump’s visit gave Israel “a golden opportunity to push for a political agreement with the Palestinians. Trump gave Israel every possible security and political guarantee to make us feel safe and in order to allow us to begin negotiations with the Palestinians. “These guarantees are key for Israel’s future behavior. We must seize this opportunity with two hands, rely on the reliable support we enjoy from the United States and move towards a deal that will allow us to preserve a Jewish, democratic State of Israel with secure borders,” Shai said. Mk Ofer Shelah from the Yesh Atid party echoed Shai’s sentiment and reiterated today is an “era of unique opportunity,” which will require strong and unprecedented Israeli, Palestinian and regional leadership. “Whoever says that one can exist without the other – a regional process without an agreement with the Palestinians or an agreement [with the Palestinians] without the serious involvement of the regional countries and of the world – is either delusional or simply evade [the truth. ]” Shelah concluded by stating the efforts towards that goal are Israel’s to create, not the US. 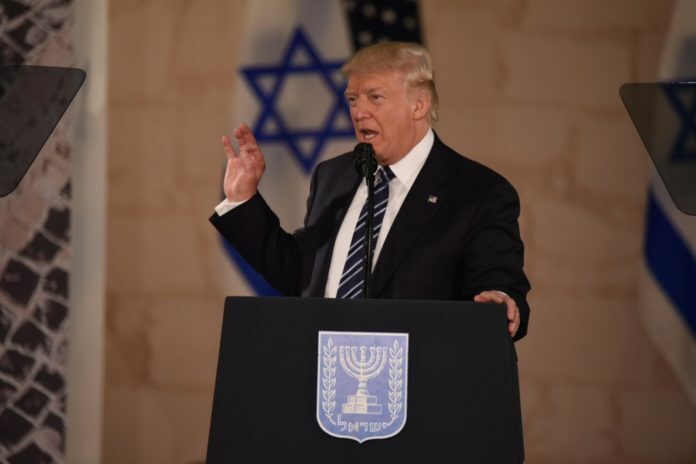 Chairman of the Knesset Affairs and Defense Committee MK Avi Dichter hailed President Trump’s statements about the connection of the Jewish people to its land, in light of the attempts by the Palestinians and other countries in the world to falsify the history of Jerusalem and Israel. Dichter and Deputy Foreign Minister Tzipi Hotovely specifically celebrated Trump’s criticism directed at Palestinian President Mahmoud Abbas that peace cannot be promoted while terrorists continue to be financed by the Palestinian Authority. Ilana Messika contributed to this report.